Your first hint about the depth of Snowpiercer is that it’s named after a gigantic plot device: a self-sustaining train that bashes through solid walls of ice and snow in order to continue its eternal loop around the world. The film is effectively the underdog version of Edge of Tomorrow: based on dystopic graphic novels, starring a reliable Hollywood actor, and far more concerned with what’s happening than why it’s happening or why anyone should care. Which parts, I wonder, did Harvey Weinstein want to trim or change? The story takes place after humans attempt to combat global warming, and instead cause a new ice age that apparently wipes out all life on Earth, though I’m not sure whose in-universe conclusion that was. Either way, the remaining people have taken refuge on the aforementioned train, whose magic engine is responsible for sustaining the lives of the few thousand humans left. A few issues already: why can’t they just turn on the engine and keep the train at a standstill? The treacherous snowstorms at every turn aren’t exactly facilitating the goal of survival. Also, even with the great length of the train, a few thousand people are not enough to keep the human race alive, so it’s kind of an all-for-nothing game already, but the narrative itself seems unaware of that, so we’re left to suspend our disbelief. We start with Curtis (Chris Evans), a Boring Hero who has become sick of the caste system put in place by those who run the front of the train. Those in the “tail section,” including Curtis’s friends Tanya (Octavia Spencer) and Edgar (Jamie Bell), as well as one-armed/one-legged mentor Gilliam (John Hurt), live in squalor and eat nothing but blocks of protein that look like Jell-O and probably taste much less pleasant. The story begins as a small army of mooks shows up and inexplicably takes away two of the tail section’s children, much to the chagrin of Curtis and Edgar, who spend five minutes speaking in exposition in a scene that would have been much more effective (and no less clear) if they hadn’t said anything at all. A would-be riot occurs, during which inciter Andrew (Ewan Bremner) throws a shoe at the wrong person: Minister Mason (Tilda Swinton at her hammiest), who then makes an example of Andrew by making him stick his arm out the window of the train, exposing it to the cold until it is frozen and useless. Then they slam it with a carnival mallet, because it’s fun to watch stuff shatter, and let’s face it, there’s nothing better to do. Through some of the exposition, we gather that there was an attempt at revolution four years ago, but no one has been able to run the gauntlet to the front of the train. But during today’s kidnapping, Curtis notices that Mason’s soldiers do not have bullets in their guns. Gilliam agrees: these guys come in here with guns every day, but have never even fired a warning shot. The next time they try something, Curtis rallies every able body in the tail section, including Tanya, whose son was one of the children abducted. The good guys defeat the guards and rush through the gates that they’re not allowed to pass. The movie still has two hours left, and it waits almost that long to try to develop the characters (y’know, after most of them are dead). 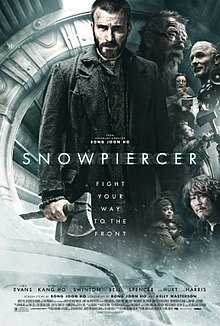 From here, Snowpiercer becomes a relentless Game-of-Death-style battle movie, in which each train car involves a different type of fighting, ranging from various Bull-shitsu to unnecessary slow-motion kills to Zero Dark Thirty found-footage night-vision. The one bit of story that happens in between involves the freeing of Namgoong Minsu (Song Kang-ho), the film’s Belligerent Savant, from the prison car, along with his supposedly clairvoyant (because that’s normal!) daughter, Yona (Go Ah-sung). Nam is the creator of the gates that separate the train cars, so Curtis’s troupe needs him if they’re going to get far. Through one thing and another, Curtis, Nam, and Yona make it to the end, where the two men have a heart-to-heart about whether they should open the final gate that leads to Wilford, the Godot Character who rules the train, or just blow a hole in the side of the car they’re in and see if they can survive outside (Nam has evidence that the snow is melting, but it’s mostly a blind-faith idea). Just in time, Curtis is invited to the obligatory Dinner at the Ivory Tower, after which he has to choose whether to become the new, erm, “conductor,” as it were. The scene prior to this, nearly two hours into the film, is the first time anything is revealed about Curtis and his motivations. It’s a pretty good scene, but we needed it much earlier, before the exhausting battles and slaughter. Chris Evans can act; there’s no question about that after The Iceman, but it would be nice if he were given the opportunity to do so before we’re asked to support his violent coup. Sadly, his steak dinner with Wilford, which is thankfully not rushed (and which reveals that, much like the revolution in The Matrix, this revolt was planned by Wilford and Gilliam in order to keep the population of the train under control), brings attention to an important bit of Fridge Logic: why does the caste system exist in the first place? No reason is given for the horrid conditions of the tail section, and it’s not as if finances have anything to do with it, since there’s no currency in this particular dystopia, just the damn train. And after enduring so much intense violence, the lack of answers or depth is a real groin-punch, and it opens the sluice gates for a zillion other questions we’d have been willing to keep quiet about if we’d gotten some attempt at resolution or character development: why, if Wilford has spent his entire life obsessed with trains, does he never use one bit of correct railroad terminology? How/why did the government greenlight the construction of a train that spans the entire world and never stops running? How does a community of people survive on pure protein, without fruits and vegetables, without getting scurvy? Why does Curtis react the way he does when he realizes that the protein blocks are made of processed insects? People eat those in real life, and in many areas, are pretty happy to have them. What is Minister Mason (Swinton’s character) “minister” of? Why is she, in all her madcap glory, cast aside early and replaced by a silent Übermook? How does such a large percentage of such a small human society have the exact body-type and low-rent aspirations conducive to becoming monstrous security guards who stand in a room all day, waiting for opponents to show up? Why do they wear black masks? Why use unreliable weapons like axes when the exact outcome of the battle is so vital to Wilford’s plan? Why does a genius like Wilford think that cutting down an already-reproductively-insignificant population by 70% will ensure the survival of the human race? Why keep the tail-section people in filth, poverty, and boredom, without even giving them the option to work jobs or somehow contribute, and then blame them for being useless? Why keep them alive at all if you only want them for their children, when the people in the front are clearly reproducing too? How did Edgar ever know what steak smelled like if he was born on the train? Why are all the women either bereft mothers or vilified? 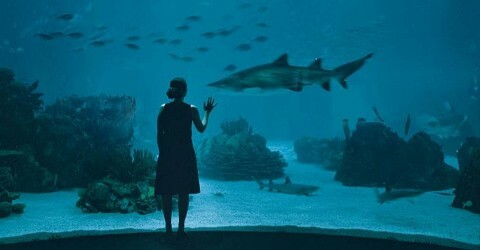 Does anyone not comprehend what Mason’s painfully obvious innuendo about keeping the aquarium population balanced is an allegory for? Most important of all, if Curtis’s anger is based around the fact that he hates himself for becoming a selfish, deranged cannibal when he and his people were first corralled into the tail section – a scenario that almost saw him kill and eat the infant Edgar, after killing his mother, when food was scarce – how does he so readily abandon Edgar to die at the hands of Wilford’s forces, and then later execute a woman at pointblank range, right after ordering one of his mates to kill yet another woman (this time a pregnant teacher played by Alison Pill)? Are we really supposed to sympathize with him after this? It’s almost as if Curtis was deepened as an afterthought, without retrospect. Does he really think he’s going to make humanity better by killing most of the remaining people? Are we supposed to be inspired by the ending, in which two whole people survive the ordeal? Good news for the polar bears. Not so much for the humans. The problem is the same one so many films and TV series have: the abundance of answers, and complete absence of justifications. The focus on plot and not on characters. We can’t care about what happens if we don’t care about the people it happens to. Again and again, these House of Cards plots dictate a film’s story, and any coincidental characterization serves only to string one noisy, desensitizing fight scene to the next one. Everyone loves to guess who will still be alive by the end, rather than get to know anyone before they’re put on the chopping block. One piece of advice for aspiring dystopians: don’t struggle to have a point. Don’t orbit some shopworn theme or broad idea. Have a character worth caring about, and don’t kill them for shock value. The rest is pretty easy. 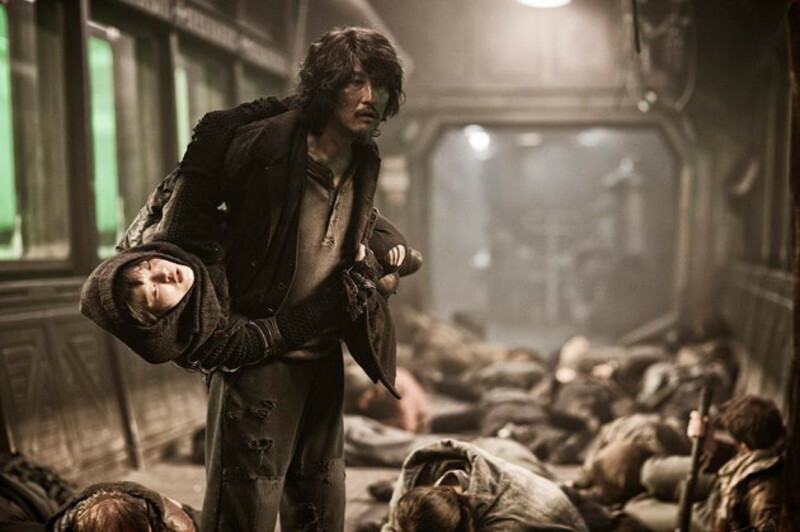 Snowpiercer (2014); based on the graphic novels Le Transperceneige by Jacques Lob; written by Bong Joon-ho and Kelly Masterson; directed by Bong Joon-ho; starring Chris Evans, Octavia Spencer, Go Ah-sung, and Song Kang-ho.